I should really call this post "down the rabbit hole". 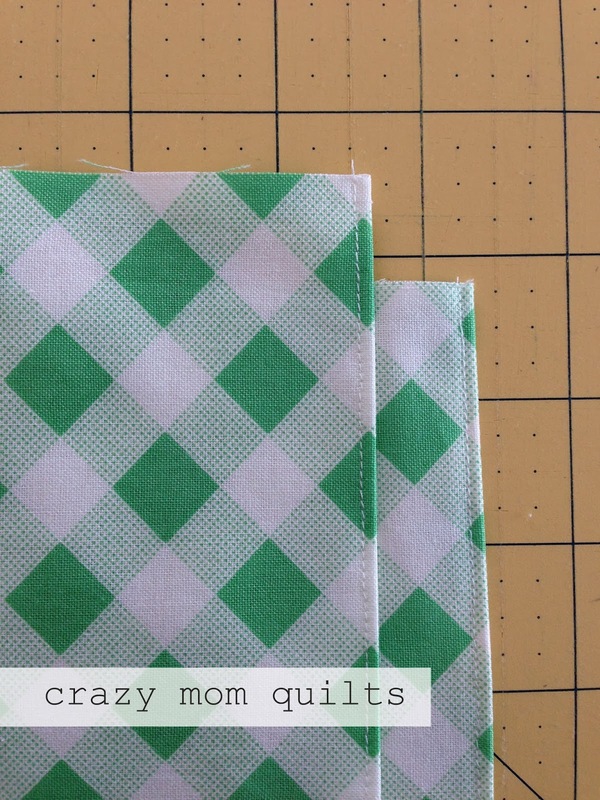 :) I had a lot of little scraps of fusible web (I use Lite Steam a Seam 2) leftover after making my waiting blocks. Since I have a hard time throwing anything away, I thought I'd use them up by making ticker tape cards. 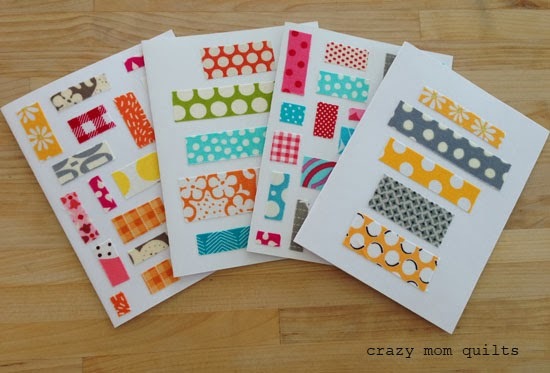 It was great to attach the scraps with fusible web rather than to sew through the card stock. I used a pressing cloth when I ironed, to protect both the iron sole plate and the paper. 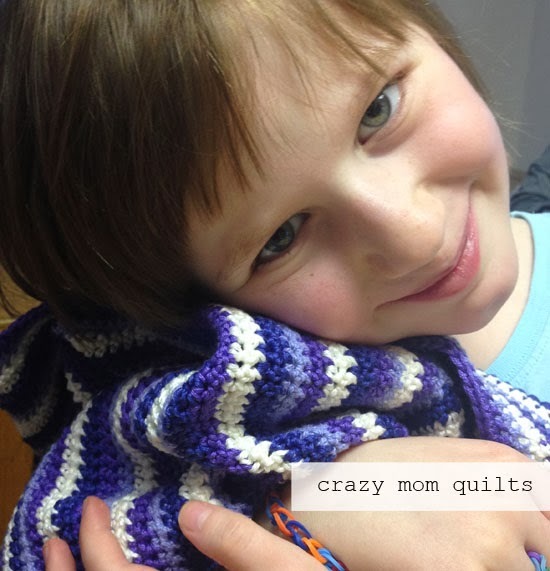 They are a little putzy to make, but I think the cuteness makes up for it! 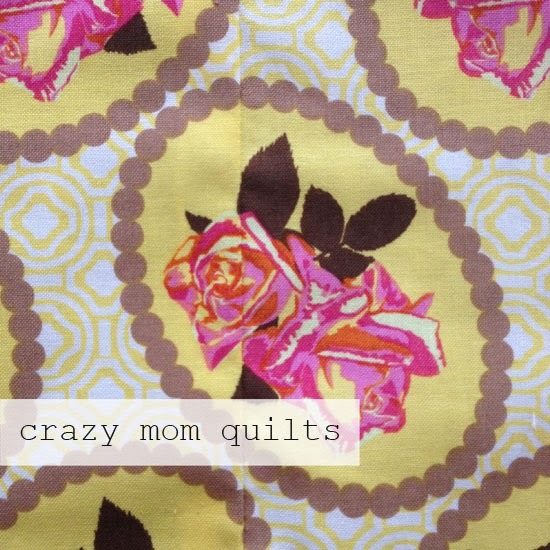 The last slivers of the original Flea Market Fancy and pezzy fabric are being put to use. Yay! Oh, and there is some Henna garden fabric in there, too. (It did occur to me when making these that I may have passed the point of no return, but I thought it was better not to dwell on that.) They sure are happy, aren't they? Each card measures 4.25" x 5.5". These are scrap project #55/101. 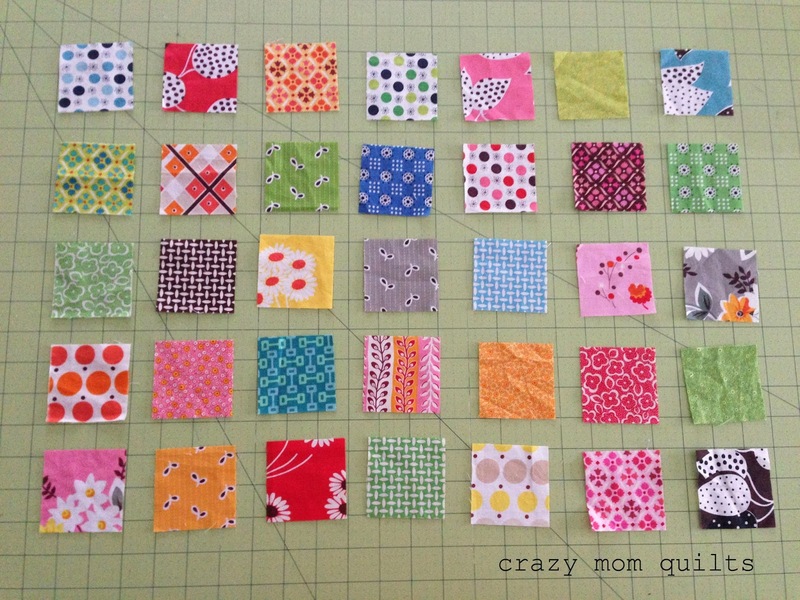 I seem to have a particularly bad case of quilter's ADD lately. I blame the weather, as a good Minnesotan would! I'm trying desperately to avoid the winter blahs by playing with bright springy colors. It's almost working. 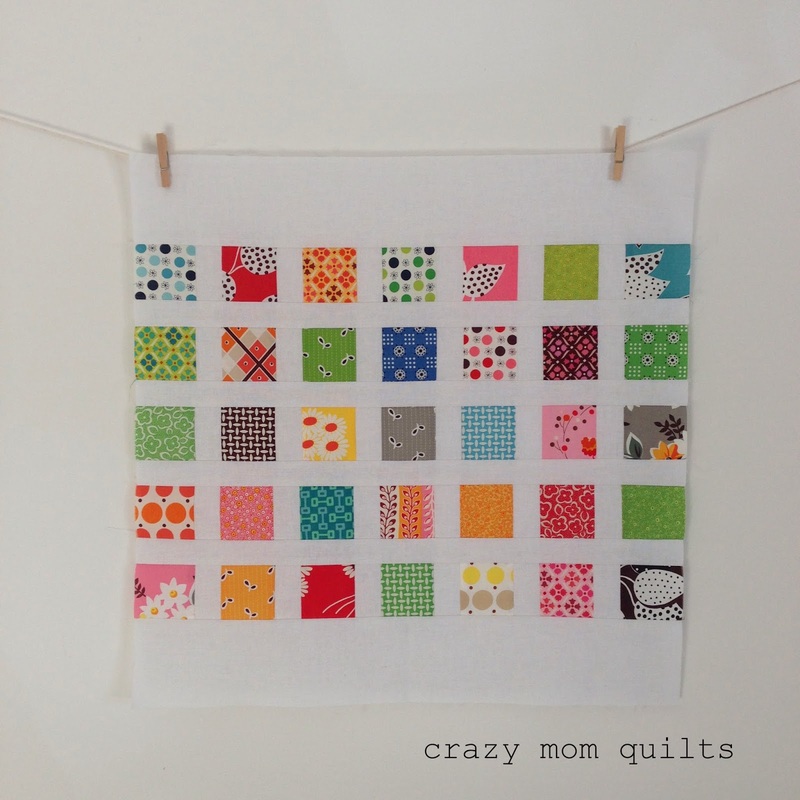 I've had one test block hanging around since last December when I wrote my waiting quilt pattern. I made several more blocks this week so now it's an official WIP. 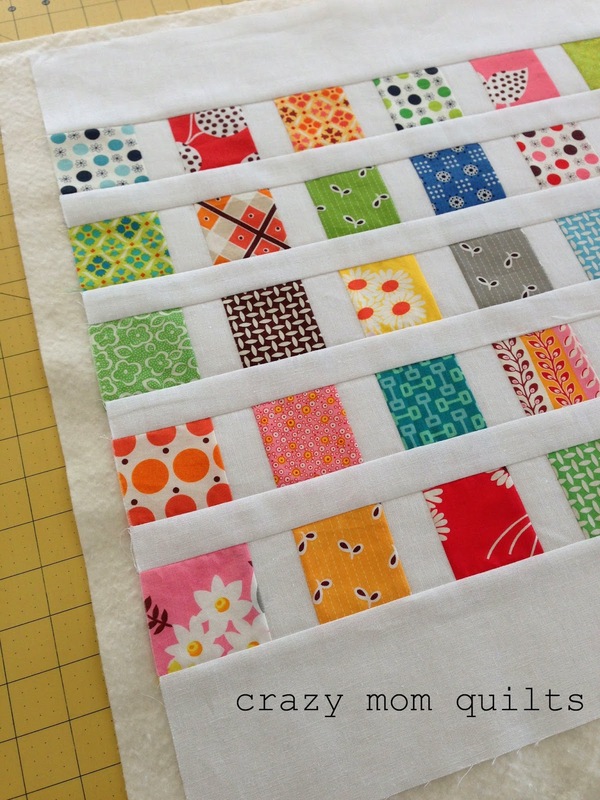 I'm using scraps this time, of course. 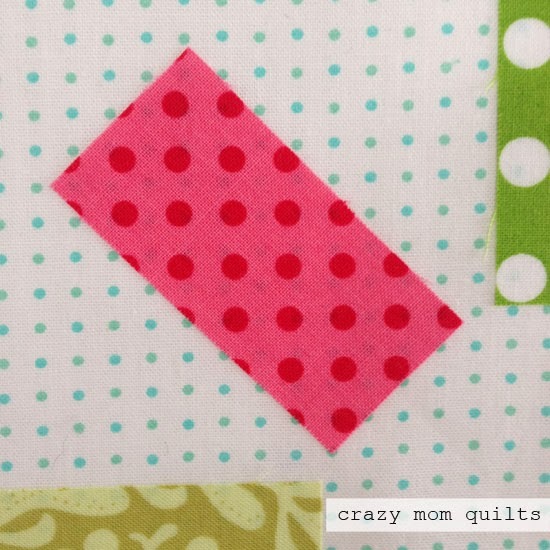 My plan was to use a variety of polka dots for the background squares, along with a few different solid whites so I could use my stash. 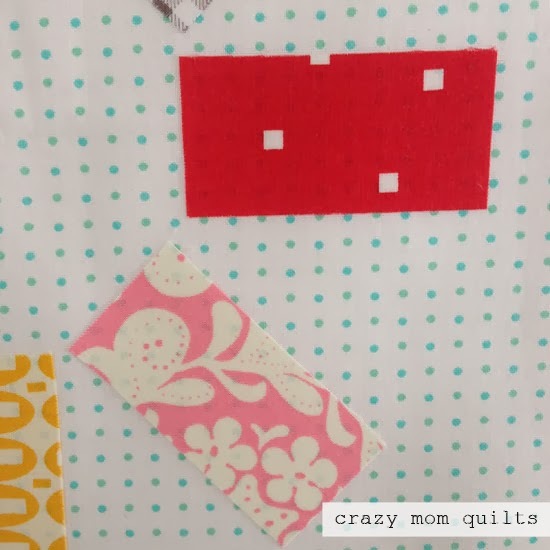 I thought it was a good idea, but after I made a few blocks yesterday I noticed that you can see the polka dots through the fabrics...even through the red! I was surprised and a little bummed. 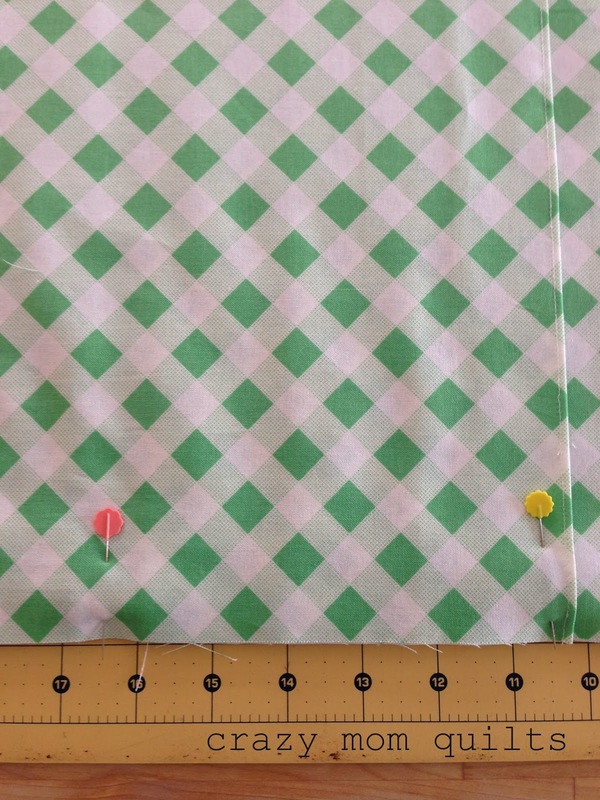 I never thought that you would see the dots through the bright pink fabric, either. I slept on it and decided to go ahead with my original idea. It really isn't too noticeable unless you look up close. 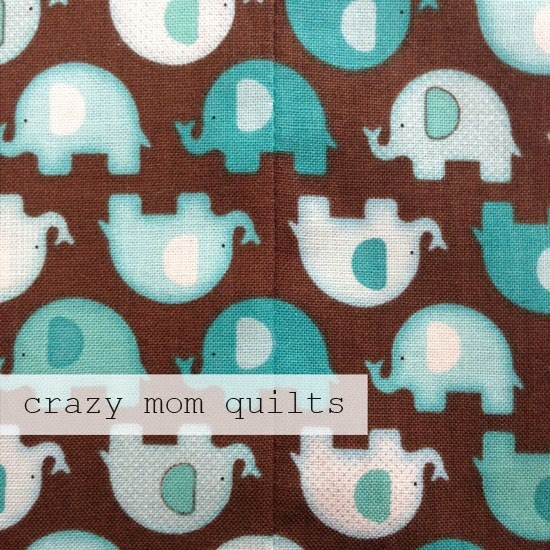 Besides, if the quilt isn't perfect to begin with (as if any of mine are) I'll be much more likely to use it. Gotta find that silver lining! Over Christmas break I did a lot of sitting around while our extended family was visiting. That means that I had a lot of time to knit and crochet. 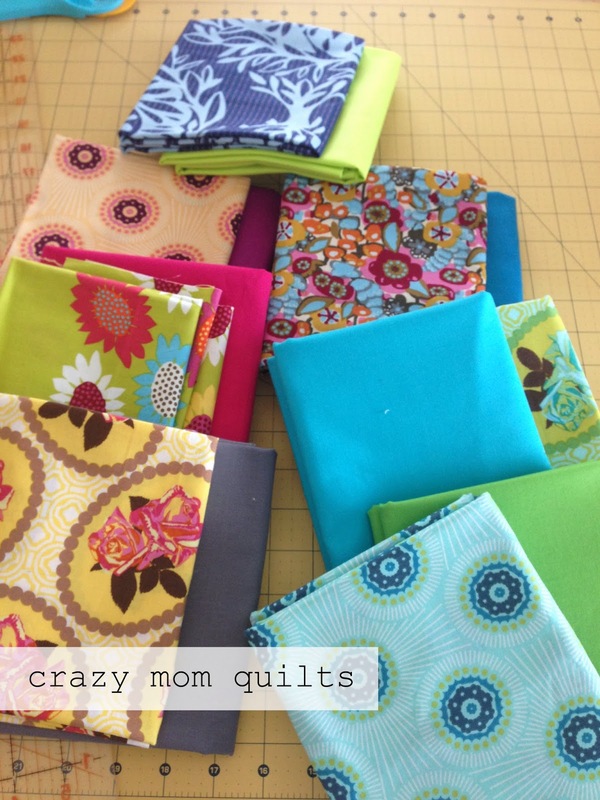 I found that starting new yarn projects curbed the need to start new quilting projects, which is a good thing! I also crocheted my girl a new blankey. Her original blankey has seen better days and I thought I would be proactive and make her a new one before her old one was reduced to shreds. I was skeptical that it would serve as a replacement, but I think it has. Hurrah! She really loves it! I'm thrilled because I had the yarn sitting around for years. It felt great to make it into something useful. And, it's in her favorite colors! Now that all those projects are done, I need a new one. I've been wanting to knit myself a sweater for years and years. Since winter seems to be here to stay (insert long rant here) I think this is the year. 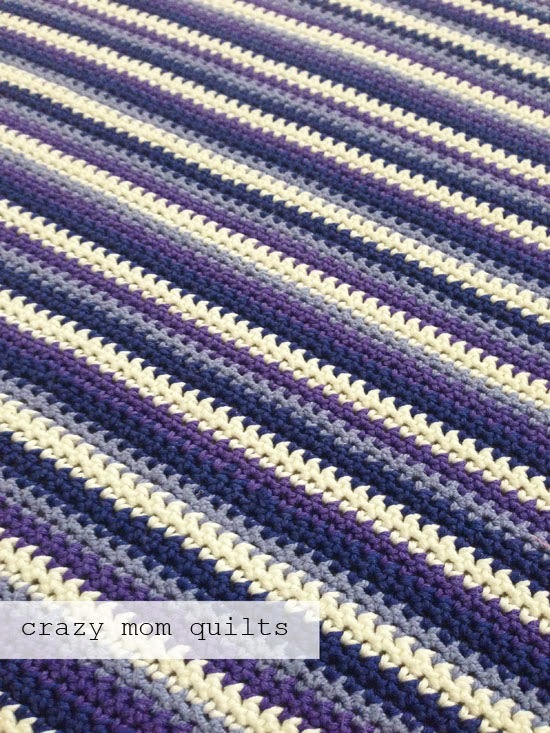 Does anyone have any suggestions for a good yarn/pattern combo? I'd love a little direction if you can offer any. Thanks! I've been thinking this over for the past few weeks and I shall procrastinate no more! 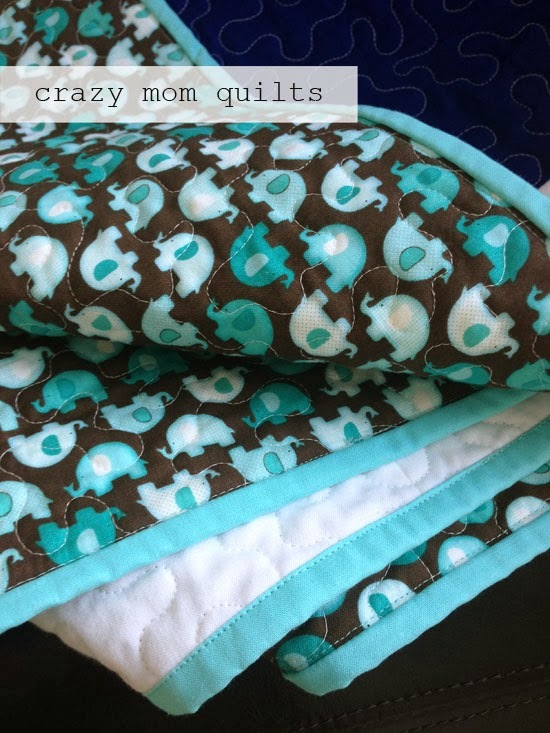 :) I've decided to put 5 quilted pillow covers up for sale. The money will be donated to one of my favorite charitable organizations, Convoy of Hope. In a nutshell, their goal is to bring help and hope to those who are impoverished, hungry and hurting. They have feeding programs for kids in 11 countries and they are consistently one of the first organizations to respond to disasters around the world. They are doing great work! These pillow covers have not been used other than for display and photos. 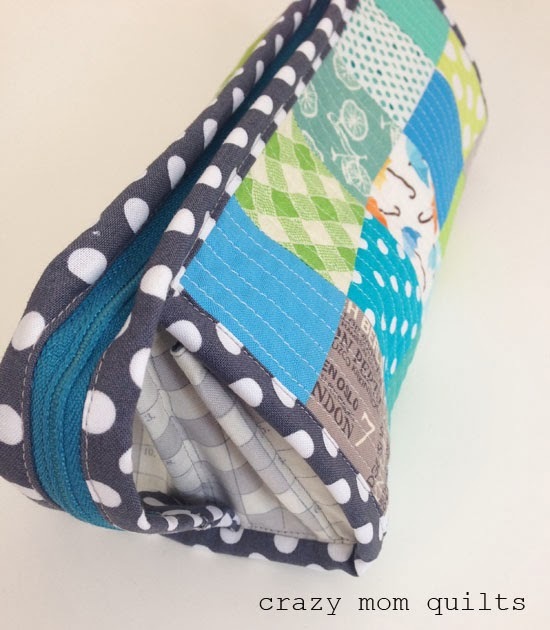 I have added fabric backings to the inside of each one so that they are safe to machine wash and dry. More details here. Two more things! Thanks for all the birthday wishes for my sweet boy yesterday. He LOVES his sew together bag. 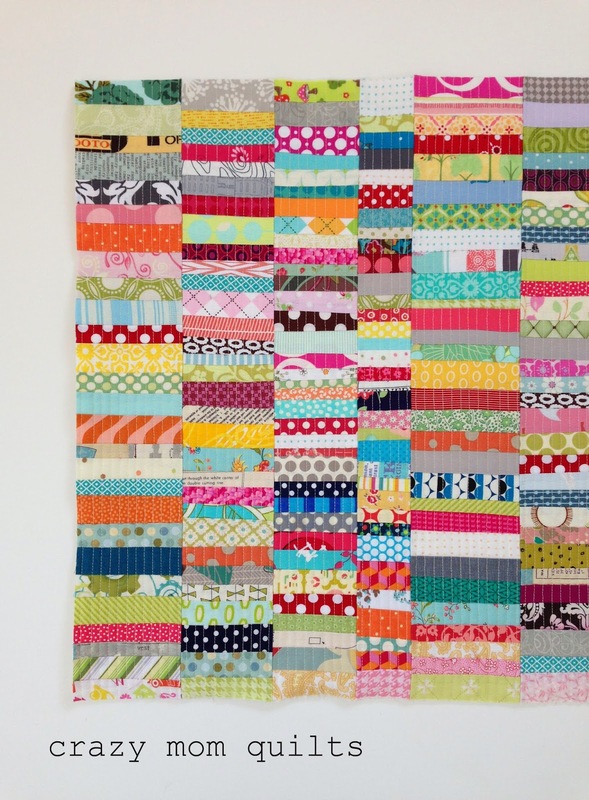 AND...thanks for all of the comments on my daughter's quilt. Your kind comments are much appreciated by all! My little guy turns 11 today. He's been asking me to make him a sew together bag since before Christmas. I figured making one for his birthday was the next best thing. Deadlines are good! I'm so excited to surprise him with it after he gets home from school! I used an assortment of colored zippers that I found thrifting many years ago. (I looked back, it was May of 2007. Hoard much?) 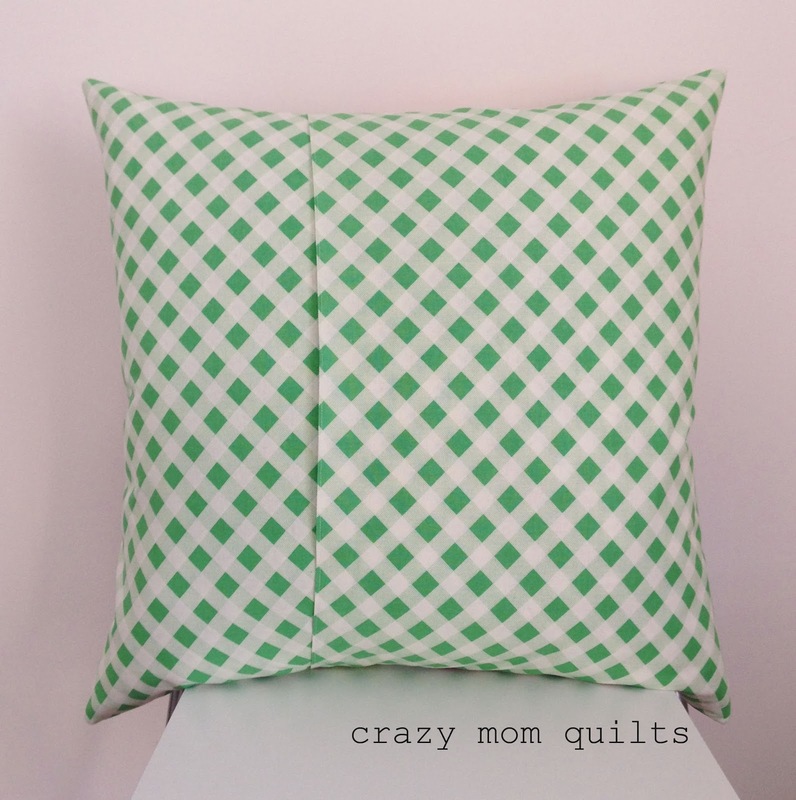 I love the lime green pocket in the middle. I didn't have the right shade of gray to match the zipper so I went with a contrasting color instead. 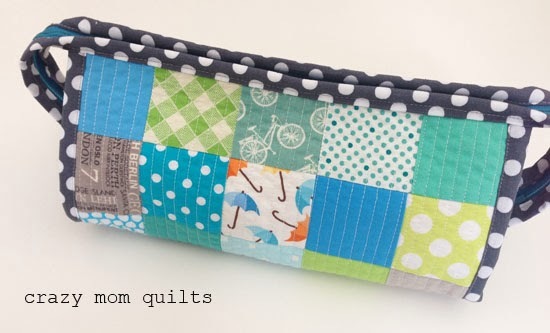 It ties in with the patchwork on the outside, too. 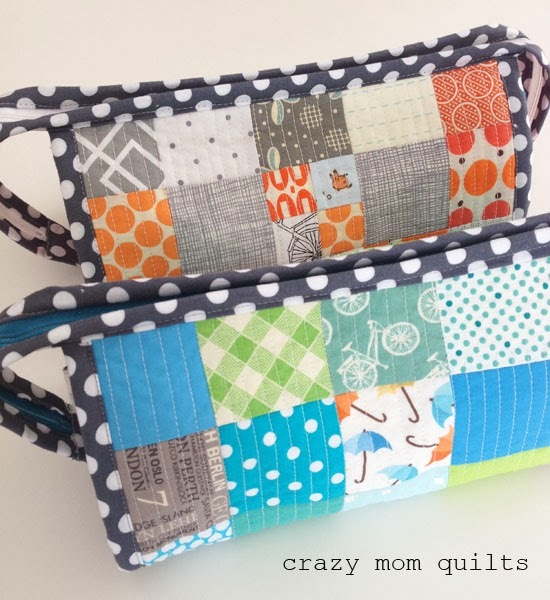 It was fun to pick so many prints for one pouch! It zips up into a nice little compact bag. I'm sure that my son will have fun filling it with all kinds of trinkets and goodies. I didn't notice until I was photographing it for the blog, but his birth year, 2003, is printed on the green patch. I'm so charmed by that accidental detail. It matches the one I sewed up for myself a few months ago. This is scrap project #54/101. Last year was the year of the big pillows, and I guess this is the year of the sew together bag. I love that my kids love hand made (almost) as much as I do. Yesterday I finished my daughter's second abstract quilt. You can read more about the design in this post. Photo taken in the middle of the street (again), but this time in the middle of a snow storm. Fun times! 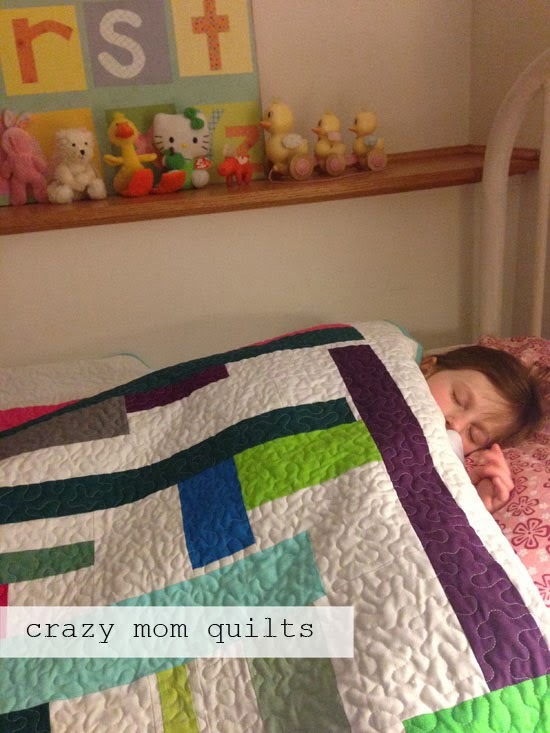 It was very fun to tuck her into bed last night with her new quilt. We are both very pleased with how it turned out! It measures about 66" x 62". And....this is scrap project #53/101. Last Friday I discovered that my Juki's bobbin winder quit working. That made me very nervous and it was the final push that I needed to take my machine in for a cleaning/service appointment. (It was way overdue. I think it had been since 2010!) I haven't quilted anything on the Juki in a long time, but as soon as went to the shop, I wanted to stipple ALL the quilts! (Of course!) Thankfully, I have another machine so at least I could sew something. After I did it once, I thought I would try it again. It's very satisfying. I could see this becoming a compulsion! 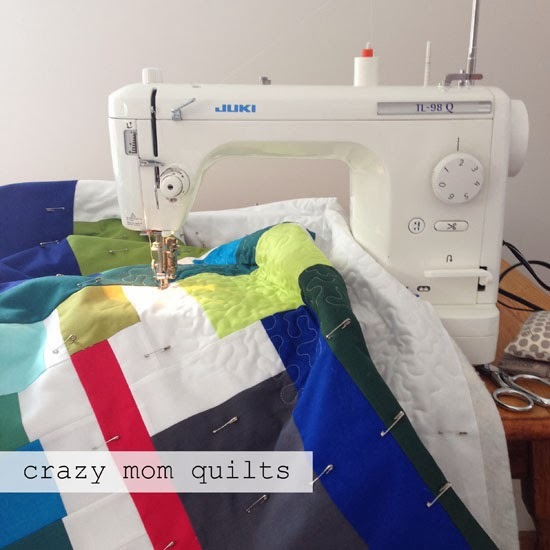 Anyway, I got the quilts basted, and I picked up my machine yesterday. 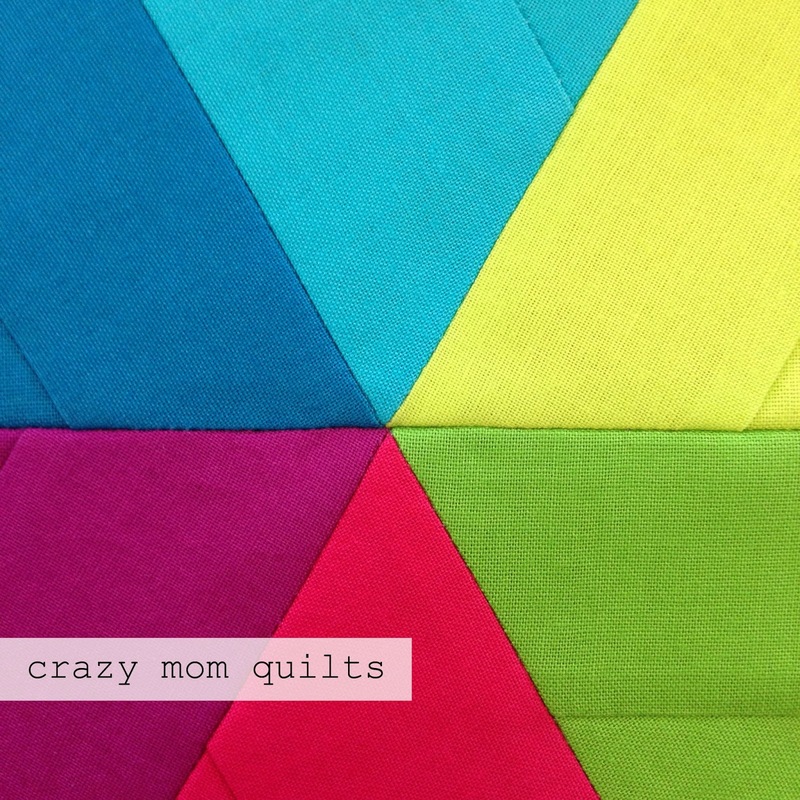 I'm so thankful that it was a speedy repair because I have a lot of quilts to finish. It feels so good to be back in the saddle again! Finished Size: 63 1/2" x 72"
I did a lot of pinning and held my breath a lot while sewing the blocks together. Some of the points turned out pretty fantastic. Some of the points are what I'd classify as pretty good. I'm not sure where to draw the line at perfectionism....but that's nothing new. I'm actually excited to baste this one and quilt it up! Yesterday a friend asked if I had Valentines ready for my kids. I kind of started to panic because the answer was no, and I didn't even have an inkling of a plan. (Don't you hate that?) This morning I picked up a few treats while I was at the grocery store. This afternoon (in less than an hour!) 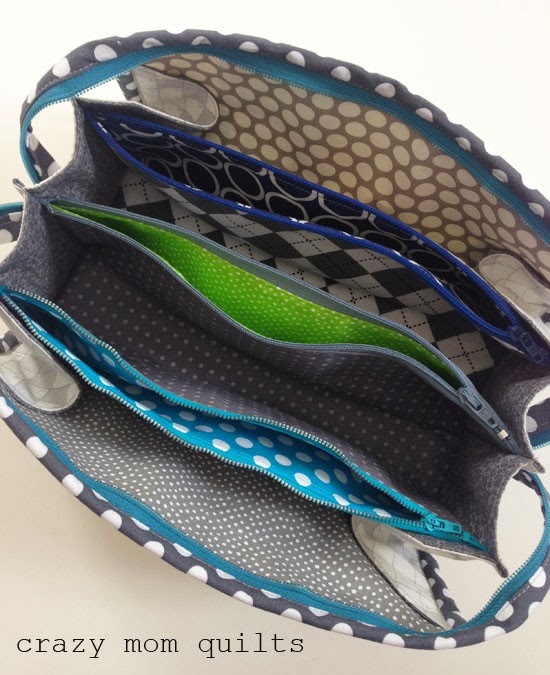 I sewed up 3 little thread catchers to hold their goodies. 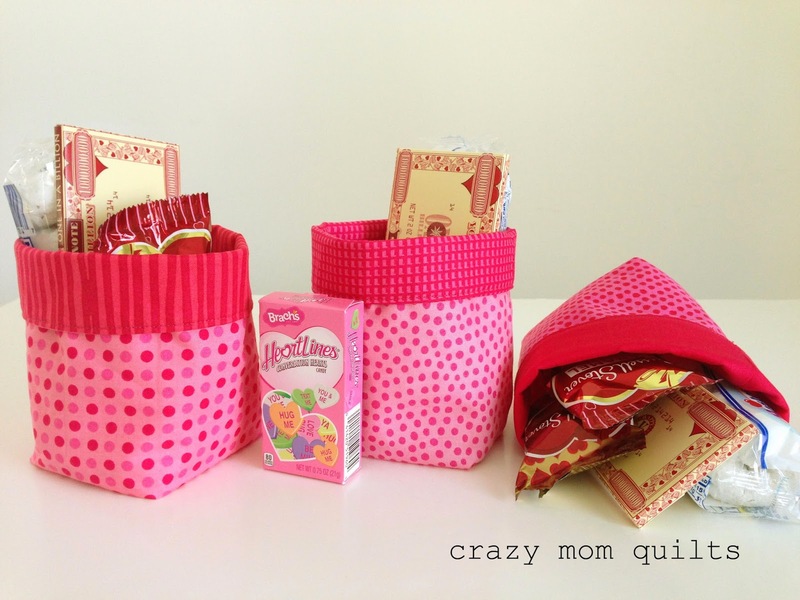 I didn't have any Valentine fabric, so I just used pink and red. (I have plenty of those in stock. Plen-ty.) So now I'm ready for Valentine's Day. A few days early, too. Sweet! 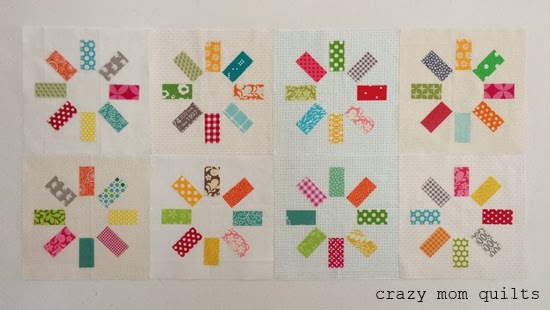 Two out of three of these used scraps, so I'm counting them as scrap project #52/101. 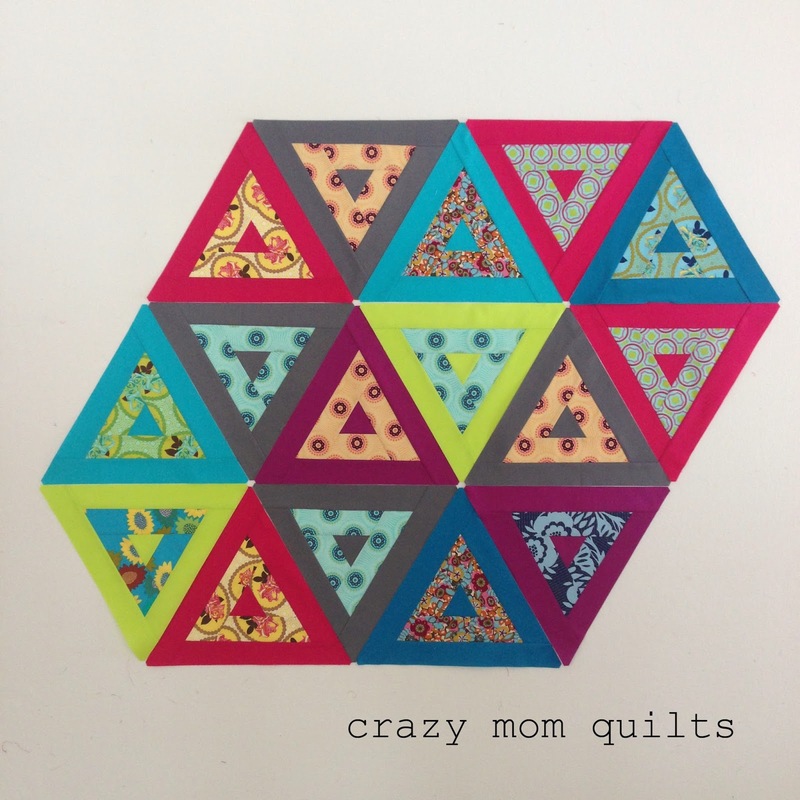 I've been starting quilts like crazy lately. So many that I've decided that (for a short time) I will quit counting my WIPs. It's a slippery slope! 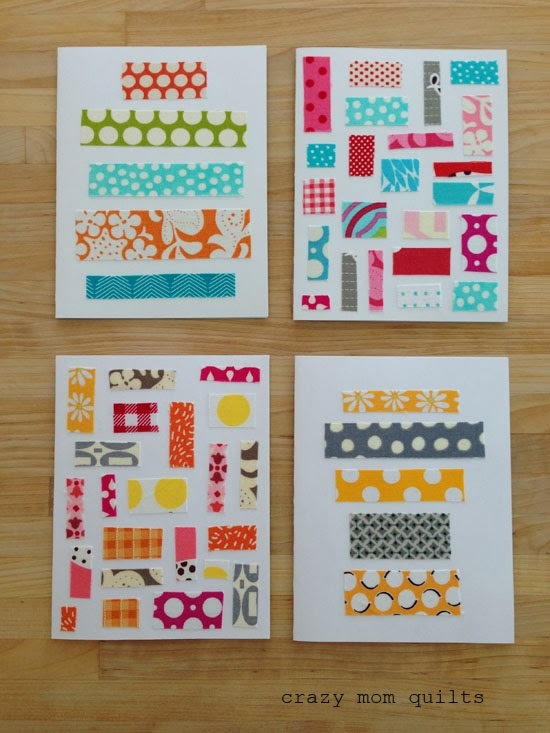 I'm teaching a few classes up in Fargo next month and I need to make a class sample. 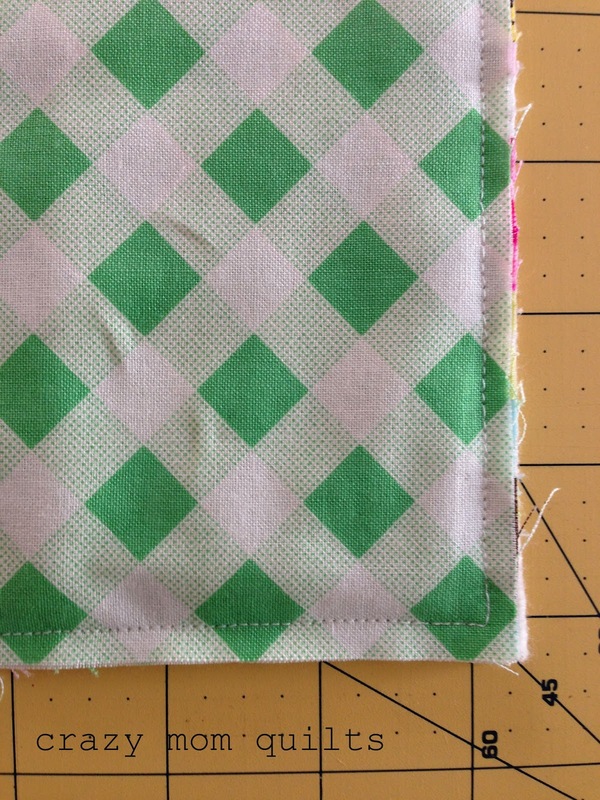 This pattern is Nap Like an Egyptian (by Cheryl) from Sunday Morning Quilts. 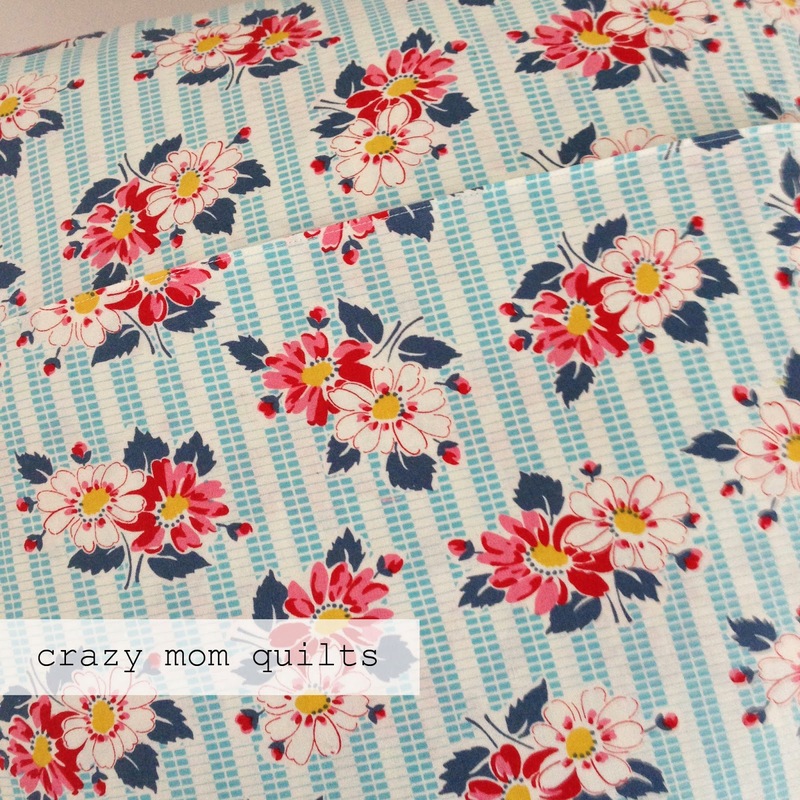 I had the hardest time deciding on a color scheme, but I finally settled on these fabrics. 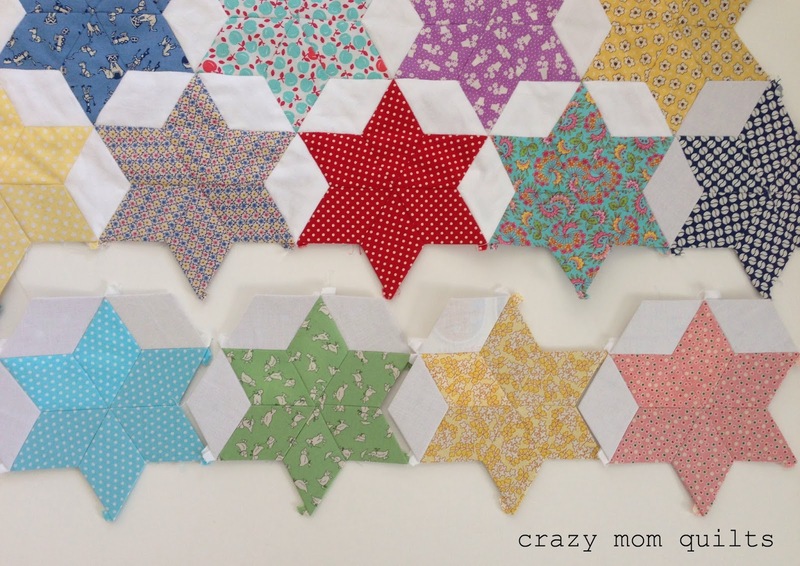 I've been working on my "oh my stars!" 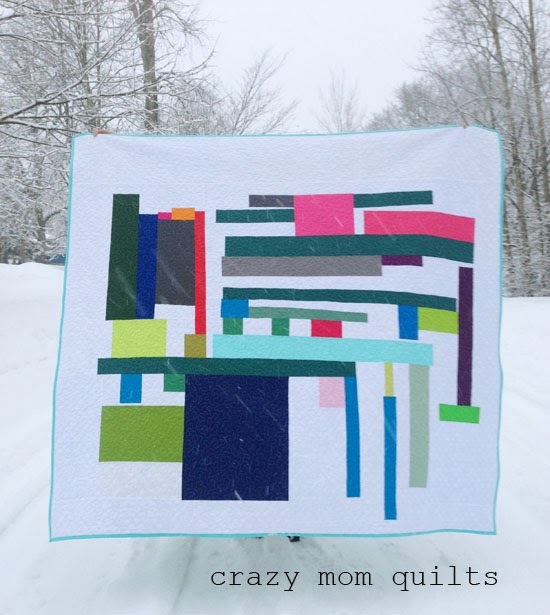 quilt with intention lately. I started it way back in April of 2011. I am so excited that I am on the home stretch! Finally! I have 5 stars left to join to the main piece. Only 5! 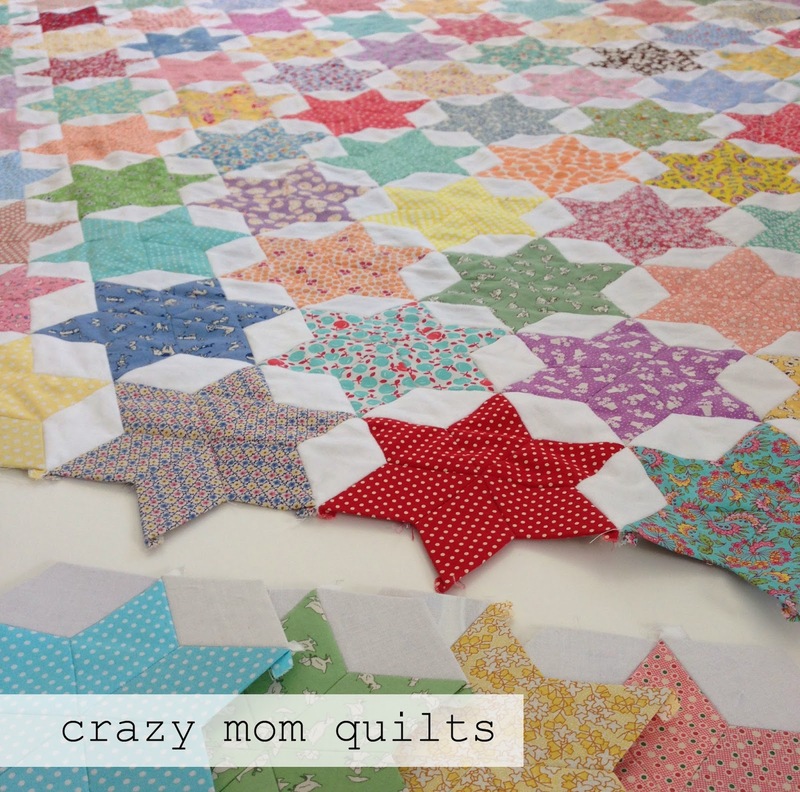 And 4 of those are already pieced. 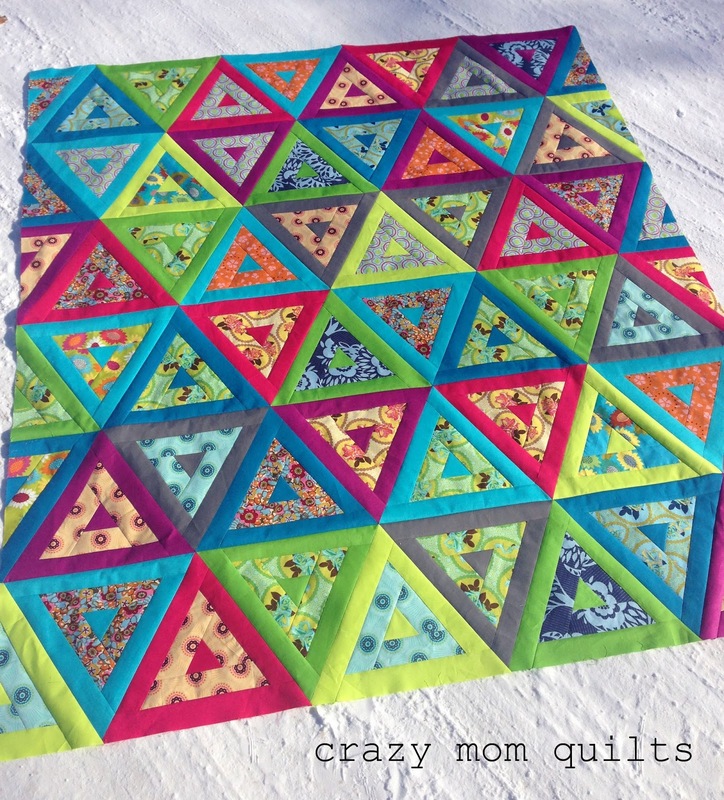 I have talked to other quilters and it seems to be a common thing to go through a phase of dislike for each quilt at some point during the making process. 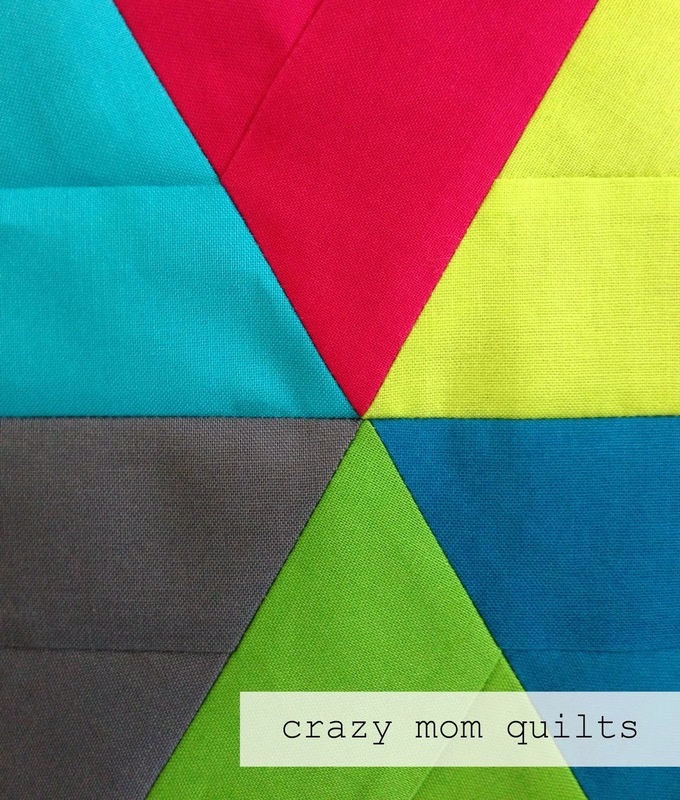 I've been through several bouts of dislike for this quilt already. Hopefully I've got that all out of my system now. I've got a brilliant plan for the border (thanks to Mary) and I'm excited to show you how that comes together. I think it's going to be fabulous! Guess what? I made another pillow! Ha! I do love the back. It's a fabric called running stitch by Michael Miller. It's a nice compliment to the front. The pillow measures 20" square. 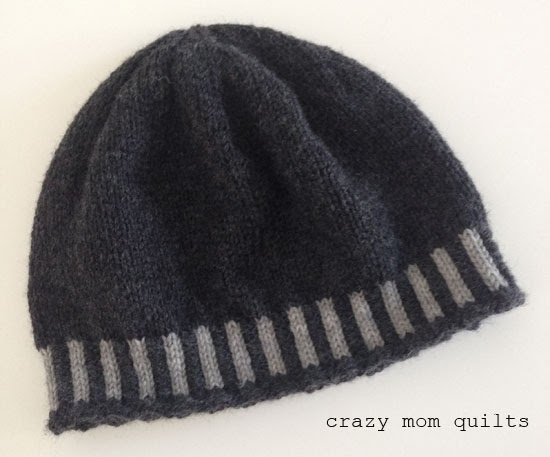 It's made from scraps, so it is project #51/101! That's half way! Thanks for everyone who joined me on my pillow week adventure. It's been a lot of fun to read your comments. So, thank you! Now it's your turn to link up your finishes for the week. Thanks for joining me for finish it up Friday! 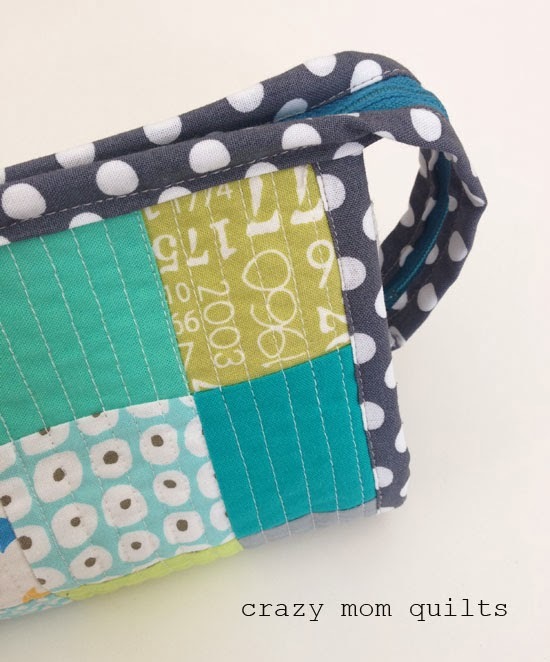 I originally designed this pillow to use a mini charm pack, but you can easily cut squares from your scraps or stash. I dug out some of my precious scraps from the original Flea Market Fancy line along with some hoarded Katie Jump Rope fabric. My background fabric is Essex linen. 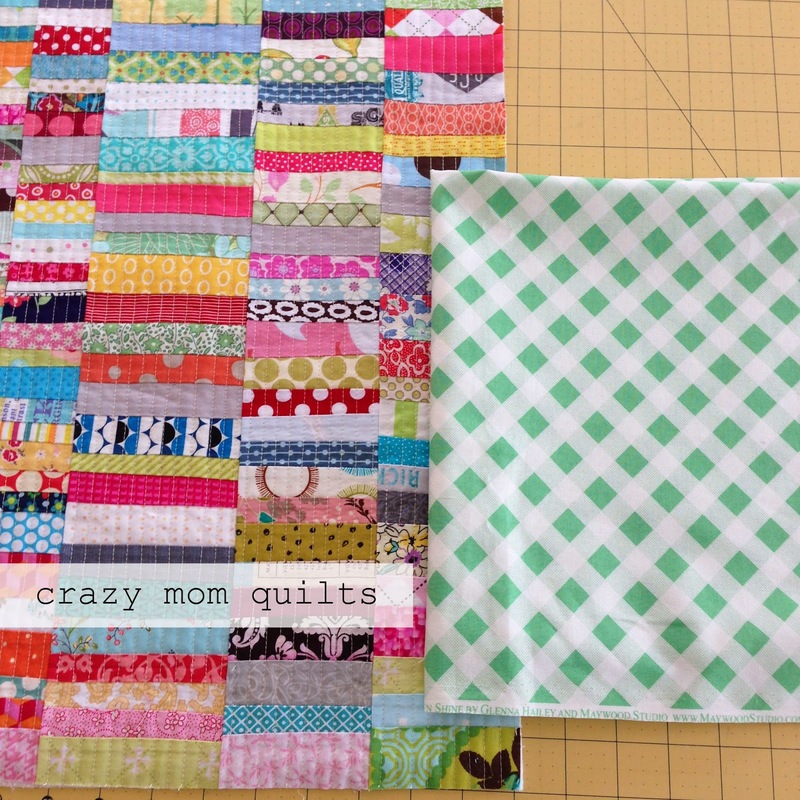 cut 2 strips 20 1/2" x 3 1/2"
cut 4 strips 20 1/2" x 1 1/2"
cut 30 strips 2 1/2" x 1 1/2"
Select (or cut) 35 2 1/2" squares. Layout the squares in a pleasing arrangement...7 across and 5 down. 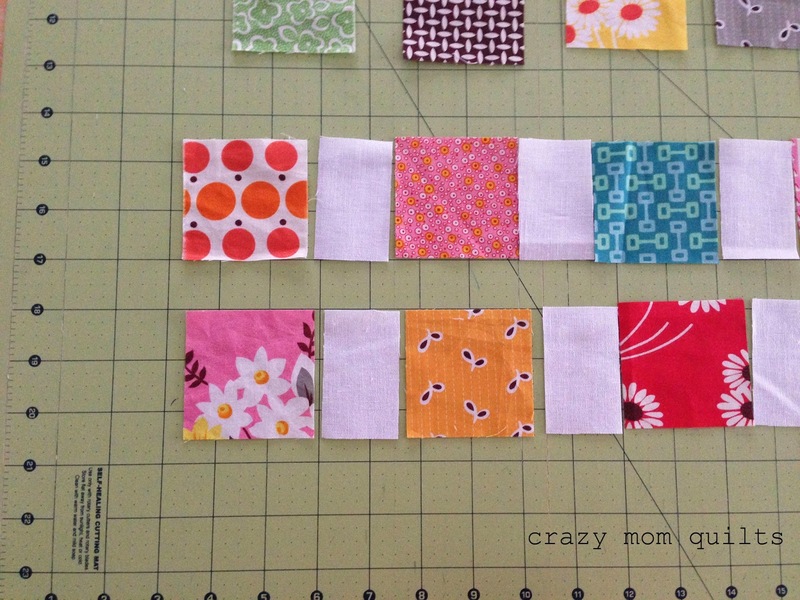 Place the 1 1/2" x 2 1/2" background pieces between the squares to create horizontal rows. 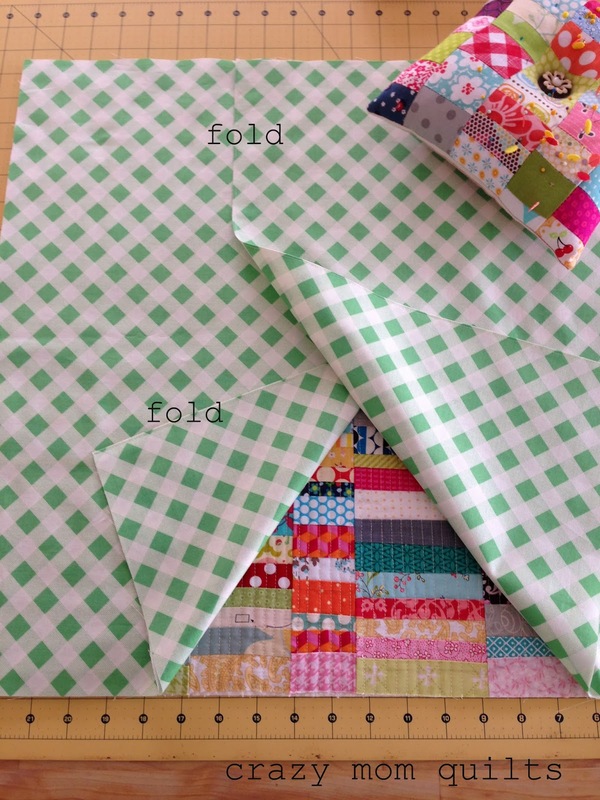 Sew the pieces together to make rows. 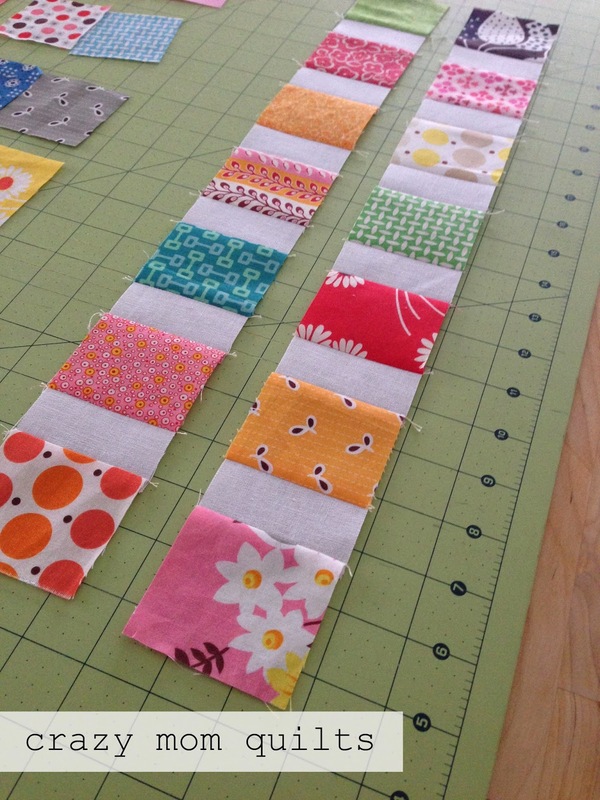 Each row should start and end with a square of fabric. 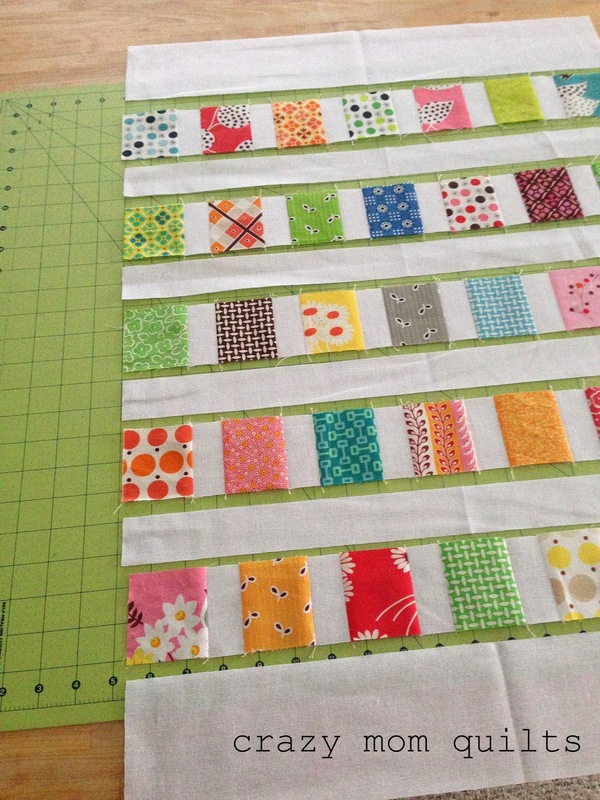 Layout the pieced rows with the remaining background pieces as shown. The 3 1/2" x 20 1/2" pieces go at the top and the bottom. But, if you actually want to finish it......place the patchwork on a 22" square of thin cotton batting (such a warm and natural). Baste with a few curved safety pins. Backing fabric is optional...I rarely use it. Quilt as desired. 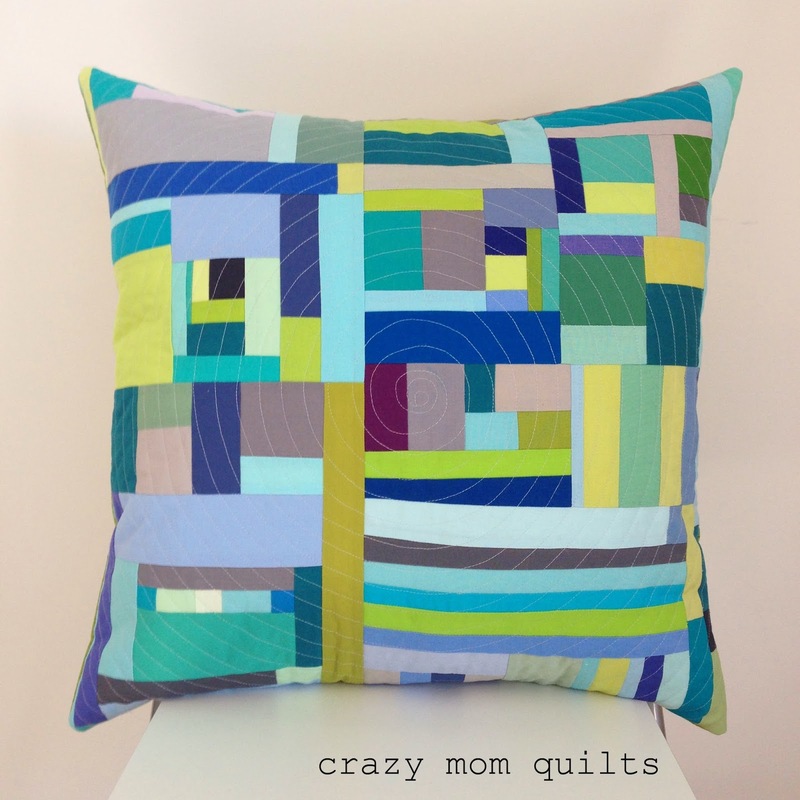 I quilted this piece with my walking foot using horizontal lines 1/2" apart. Insert a 20" pillow form. You can either purchase one or make your own. For those of you following my progress, this is scrap project #50/101. I'm pretty excited about that! 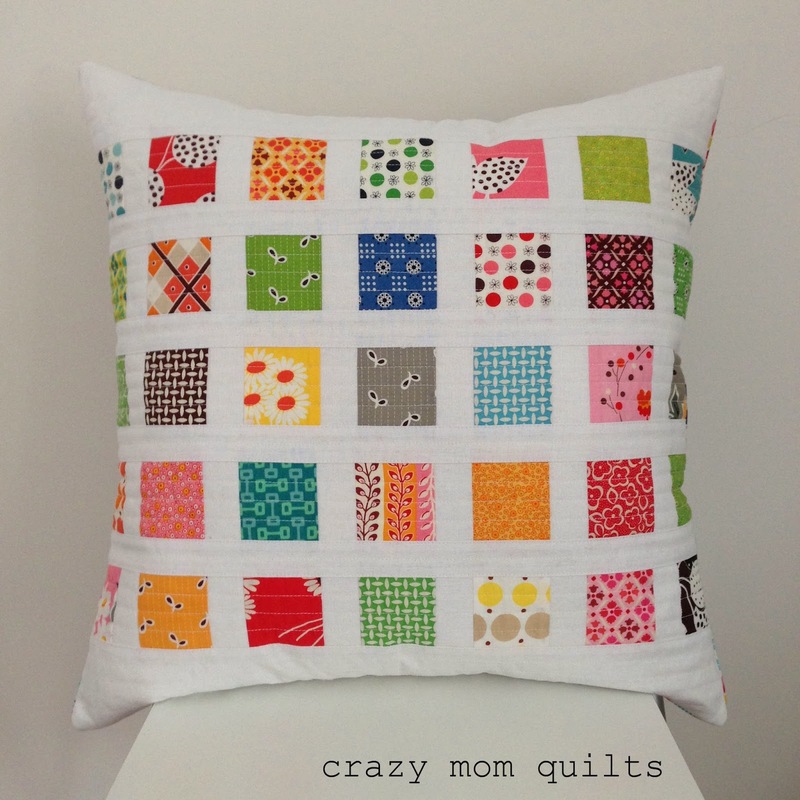 I made this pillow last December using the same pattern. I used white kona cotton and a mini charm pack of Potluck by American Jane for Moda. I really love this one, too! You can see/read more about it in this post, if you'd like. 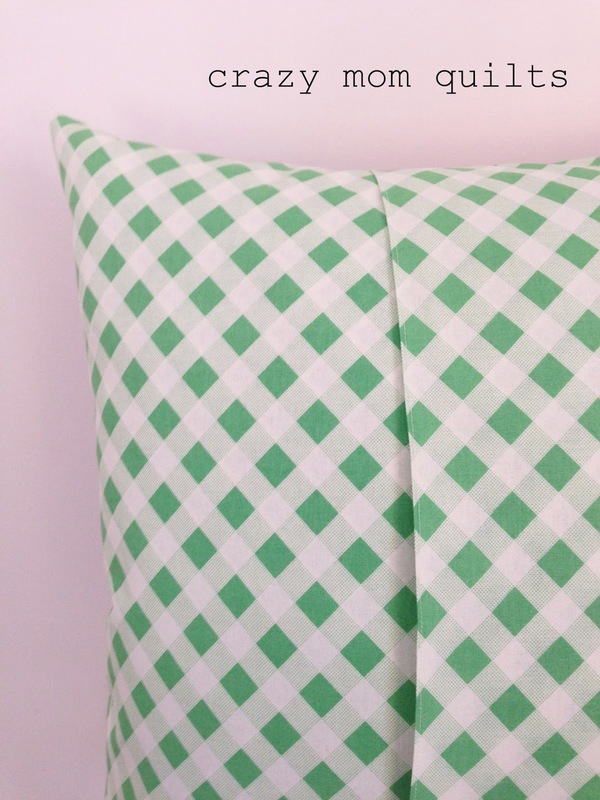 If you make contact print pillow, I'd love to see it! Well, I wasn't kidding when I said it was pillow week here! 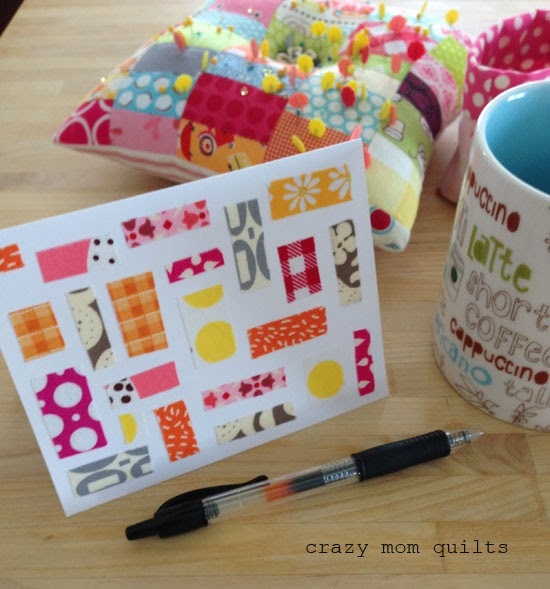 Today I'm going to show you my favorite way to make an envelope backing for a quilted pillow cover. As always, this is just one way to do it. First off, let me talk just a bit about the front of the pillow. 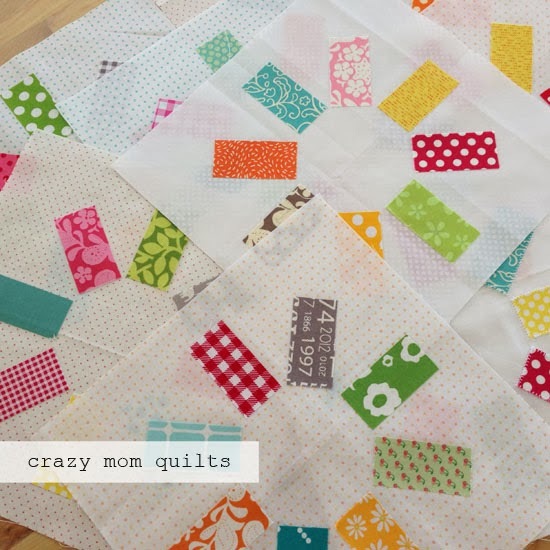 Make the patchwork, then layer it on a piece of thin cotton batting (warm and natural or something similar). You could use a square of muslin or some miscellaneous fabric for a backing, but I don't bother. Quilt the patchwork, then trim down to size. I shoot for 20 1/2" square. 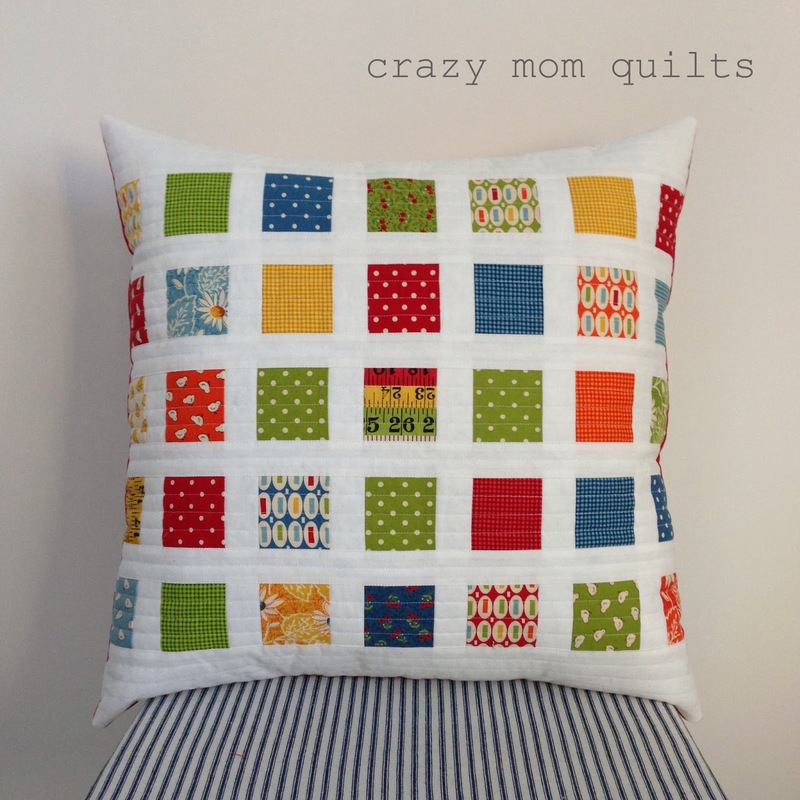 Gather your supplies...the quilted pillow top and 3/4 yard quilting cotton for the backing fabric. From the quilting cotton, cut two pieces 26" x 20 1/2". 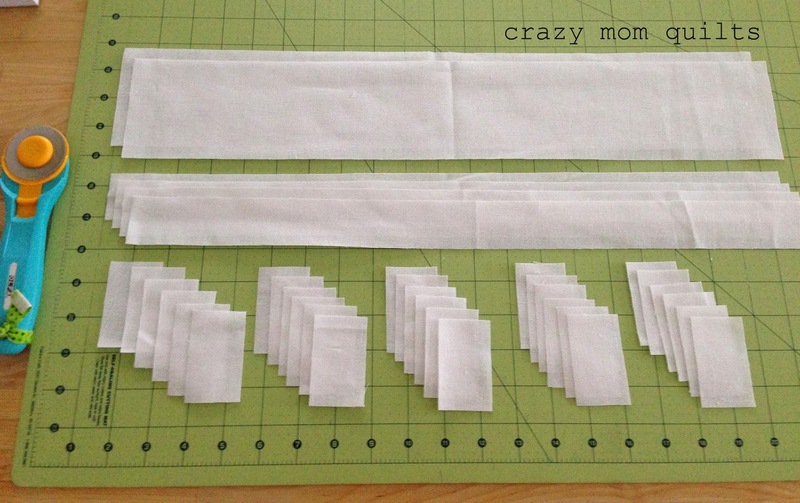 Fold each piece in half so it measures 20 1/2" x 13". 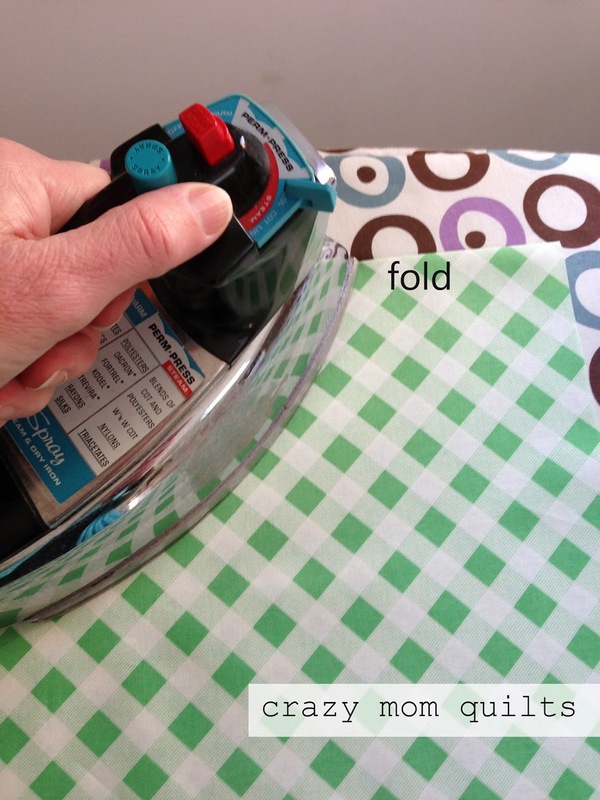 Press the fold line well with a hot iron. 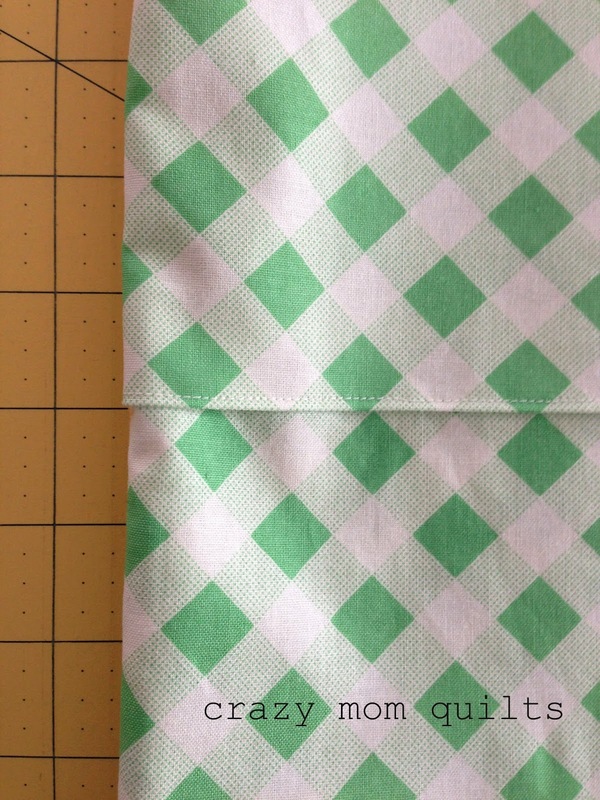 Sew near the fold line using an 1/8" seam allowance. Place the pillow top right side up. Place the backing pieces on top of it, as shown in the photo above. 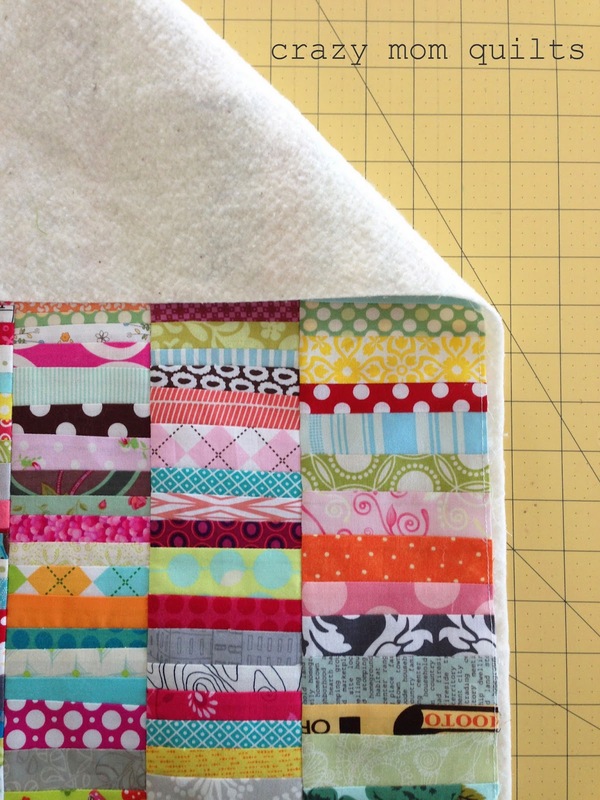 The raw edges of the backing should line up with the raw edges of the pillow top. Folds should be in the middle. Flip the pieces down into place. There should be an overlap of about 5"-6". (See pin placement.) Pin the layers together around the perimeter of the piece. 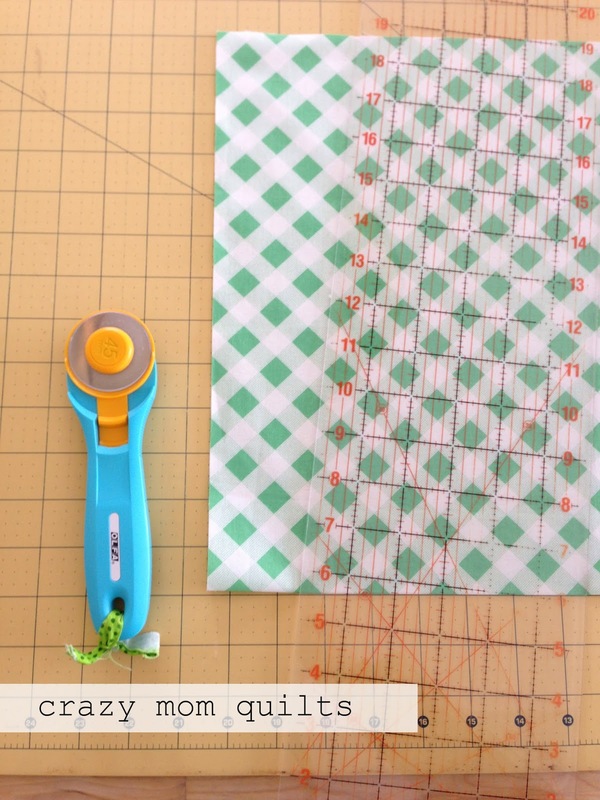 Use a walking foot to sew around the ENTIRE piece. I use a 1/4" seam allowance. (You can use a 1/2" seam allowance if you prefer, just be sure to adjust your measurements accordingly.) Reinforce the stitching several times where the backing pieces overlap. These will be the stress points when you are stuffing your pillow form into the cover. The reinforced stitching helps a lot. Trim the corners. Turn right side out. Poke out the corners with a blunt tip scissors. The backing looks nice and tidy. 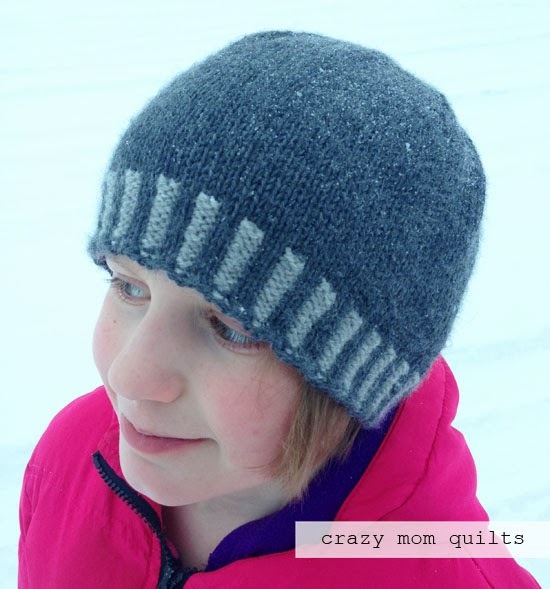 No finishing stitches required! Stuff your pillow form inside and you are done! I love the way this looks....so crisp, clean and tidy! 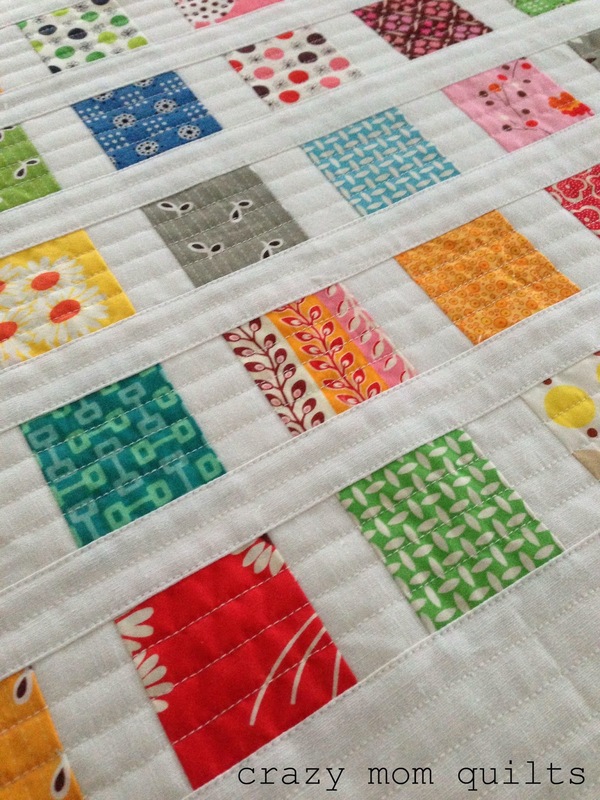 The double layer of quilting cotton is a nice weight for the pillow backing. I've been using this technique for years and they have stood the test of time. 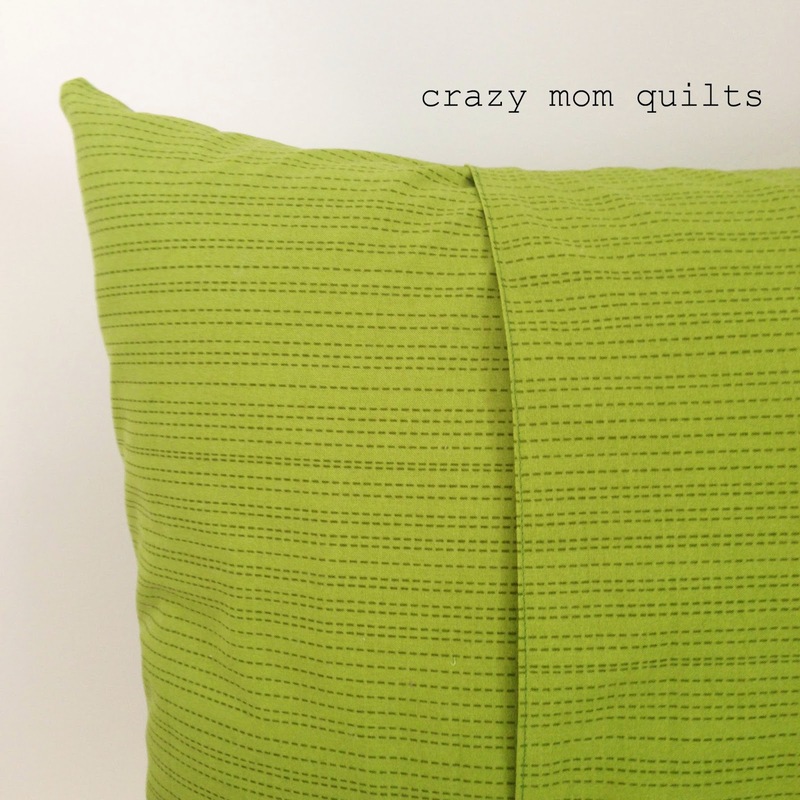 If you want to see the pillow front completed, I shared it in this post. I hope you find this tutorial useful! If you have questions, I'll try to answer them in the comments. 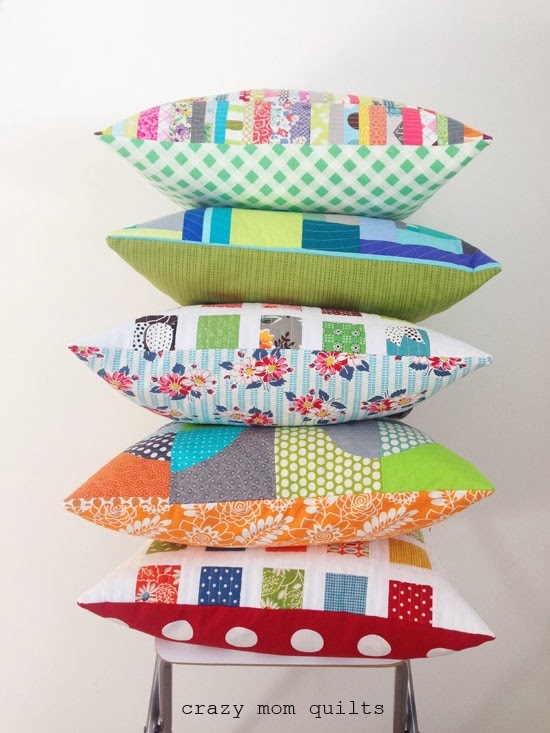 Go forth and make pillows!